Recent publications suggest that transluminal interventions may be a promising alternative to laparoscopy in the field of minimal invasive surgery. Until now it remains unclear which endoscopic technique should be applied and which access route is considered safe and feasible. Possible indications for natural orifice transluminal surgery (NOTES) are still under discussion. 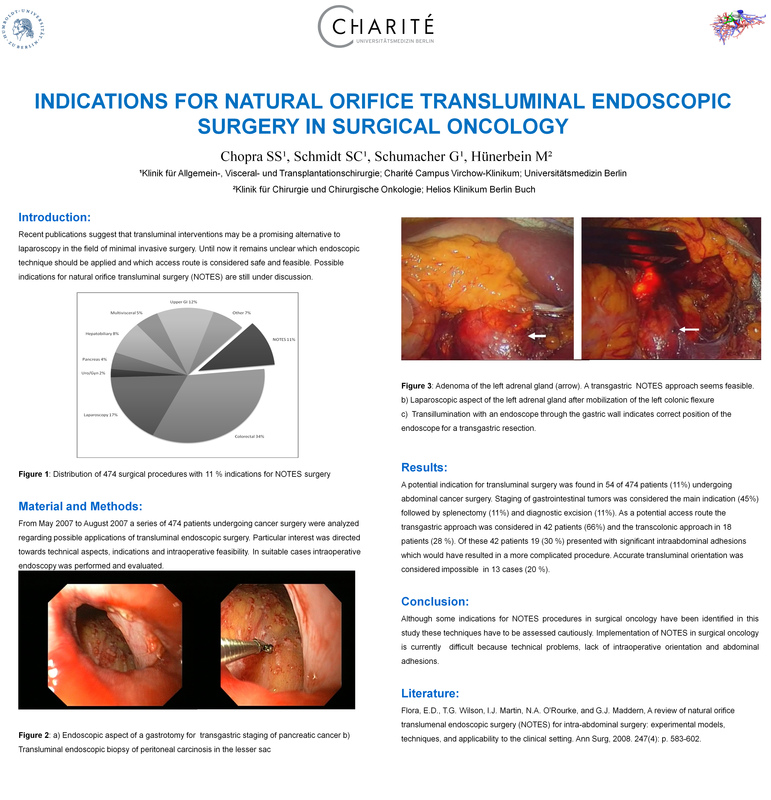 From May 2007 to August 2007 a series of 474 patients undergoing cancer surgery were analyzed regarding possible applications of transluminal endoscopic surgery. Particular interest was directed towards technical aspects, indications and intraoperative feasibility. In suitable cases intraoperative endoscopy was performed and evaluated. A potential indication for transluminal surgery was observed in 64 of 474 patients (11 %) undergoing abdominal cancer surgery. Staging of gastrointestinal tumors was considered the main indication (45 %) followed by splenectomy (11 %) and diagnostic excision (11 %). As a potential access path the transgastric approach was chosen in 42 patients (66 %) and the transcolonic approach in 18 patients (28 %). Approximately 19 possible NOTES patients (30 %) presented with significant intraabdominal adhesions which would have resulted in a more complicated procedure. Intraoperative orientation was considered difficult in 13 cases (20 %). Although some indications for NOTES procedures in surgical oncology have been suggested these techniques have to be assessed cautiously. A future implementation of NOTES in surgical oncology is currently challenged by technological difficulties, restricted intraoperative orientation and frequent abdominal adhesions in this clientele.